From a large corporate house to a small business, everybody is busy in decoding the law of goods and service tax (GST) so that they can remain compliant and they do not have to pay the interest or penalties unnecessarily. However, it is easier said than done. The law of GST is so confusing that most of the taxpayers are committing mistakes while filing the GST returns. As said, we have received a number of queries for resolving the mistakes committed in GST return from every quarter of the industry about the GST return including the multi-national companies (MNCs) and even government department. Further, there are some mistakes, which could prove to be fatal for a smaller business or even for a large corporate house and hence, make sure you do not commit these four mistakes in GST return. This is one of the asked queries of the taxpayers, as people are very confused between the three heads of GST i.e. IGST, CGST and State GST (SGST). Let us understand this query with the help of an example. The total liability of the ABC Ltd is Rs1.55 crore and the total ITC available to the company is Rs51 lakh. Hence, Rs1.04 crore needs to be paid to the government. This is what the ideal situation should be. Now the question of the taxpayer is that whether he can utilise the excess cash balance in CGST against the balance of IGST? As per the legal provisions of GST, the excess balance in electronic cash balance cannot be utilised against any other head. For example, the excess balance paid for CGST cannot be utilised the liability of IGST. Hence, in our case, ABC needs to pay the IGST again and keep the excess balance in CGST for future adjustments. Further, in case the person is not able to adjust the excess balance in CGST, then he may claim the refund of the excess balance in CGST. Due to this error committed by the ABC, the amount of Rs11,00,000 get blocked in electronic cash ledger and due to this, the shortage of working capital for shorter duration may arise. If by mistake you have entered values wrongly under reverse charge, then you really have performed a sin and the punishment for this is to pay the additional tax liability to the government. Let us understand the concept of reverse charge. The government has notified certain cases where the recipient is liable to make payment of GST to the government. However, the important point is that the person has to pay the GST liability on a reverse charge from cash and not by input tax credit or ITC. Now, suppose ABC made a supply of Rs50,00,000 at 18% tax, which amounts to Rs9,00,000. Now, if ABC also enters this transaction under reverse charge wrongly, then the company shall be liable to pay additional Rs9,00,000. The only solution to this problem is that one has to pay the additional tax since the return cannot be revised and claim the ITC of the tax paid because any tax paid under reverse charge can be claimed as input tax credit (ITC). This is a very important point for the exporters because if any mistake is committed at this step, then he might not able to claim the export benefits. Let us understand how exports are treated under GST. Under GST, exports are zero-rated. Here zero-rated does not mean that exports are taxed at ‘0%’ rate rather it means that exports should be taxed at not, that is no tax on output and no tax on input. Normal taxable supply: Any normal supply of goods or services, which carry a valid tax invoice and the tax has been calculated properly and shown in GSTR 1. Exempted or nil rated supply: Nil rated supplies are those supplies, which are taxed at nil or ‘0% rate’. This is different from a zero-rated supply. Because in case of nil rated or exempted supply, the ITC is not allowed to the taxpayer. However, in case of zero-rated supplies, all the tax paid on input is also refunded back to the customer. Zero Rated supplies: Zero-rated supplies are supplies, which are zero taxed at both input and output. Zero-rated supplies include exports and supply to special economic zone (SEZ). Taxpayers do not understand the above difference and hence they used the terms interchangeably. Due to this, they tend to enter values of exports against nil rated. As soon as values are entered against the nil rated supply, they become ineligible to claim the ITC as a refund and hence it can lead to disaster for an exporter. GST is not like income tax where no return is to be filed if no income is earned. Under GST law, if the GST registration is obtained then it is mandatory to file the GST return even if there is no turnover. If GST return is not filed one time, then there is a late fine of Rs200 per day. Now, we will explain to you if you forget to file the GST return for one year and we assume that highest penalty is applicable. The maximum penalty per return per month will be Rs10,000. Total returns to be filed each year under GST [(3 X 12) + (5 X 5)] X 10,000 = Rs4,60,000. 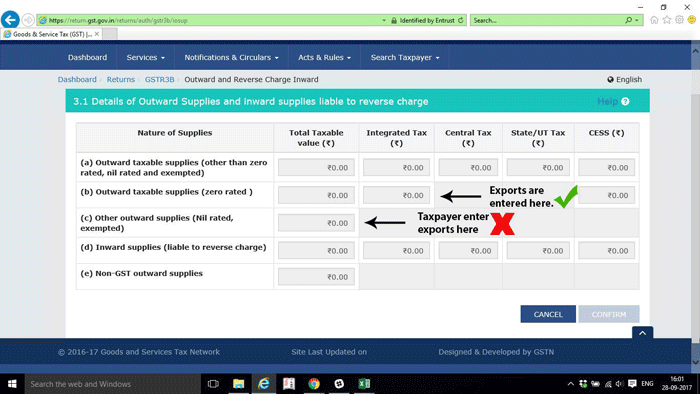 You can see that even if you do not earn even a single rupee, however, you forget to file the GST return, then you shall incur Rs4,60,000 as late fees. We have tried to explain the four errors committed by the taxpayers more often and get them into trouble. Hence, through this article, we want to also recommend that if you are not fully aware of the GST law, then you should hire a professional to file GST returns.